The city in memory is a phantasm and it is the most banal of detail, it is full of imposters, stand ins, a madman’s architecture at times and dull accuracy at others. It is a map moth eaten and yet at certain times more than pristine. Location is not only of maps and directions. It is not only of a layer or even a few layers of augmentation and data we carry with us. Locations are experienced, visited once or thousands of times, leave traces as much as human footsteps and wear mark them. Architecture also is not simply design and build, it is of experience. This is increasingly urgently relevant in this screen obsessed moment in our history. We have digital architectures, social architectures and we have the architectures of places in recall. This text is an experiment in moving through spaces in recall. The following texts are part of a project in development that will place first person interactive architectural models in maps online. The key difference from other works and areas of locative media and spatial augmentations is that these works are from memory. They will be flawed. They will be varying in detail. With the emergence of other works from others they will be part of a layer/layers of spatial augmentation by recall. A group of former workers will write of a workplace long demolished, each space one can interact in made from an individual’s recall and memory and collectively several places will emerge, several utterances and iterations. This will be space resonant with how it seen and measured not of cold numerical data but of human interaction and experience. The texts may also be the emergence of a newer hybrid mode of writing needed in this time of precise measure and the falling away of such things as getting lost and searching for a lost memory without reaching for a search engine. The city is already skinned with data and locative media. There is poetry in recall, there is critical theory in moving through a space as though reporting live into text the past and the forever luminously imperfect. This is not locative narrative per se, but is its cousin , neighbor, a locative writing not of data or superimposed pre-existing story, but of space itself, of place but as one carries it. It is amazing what a great and horrid craftsperson spaces in recall reveal; scale gone to hell, blank spaces, weird temporality, the realization of markers missing and yet a glorious array of oddly vivid and near tangible detail(s). I am walking through San Francisco in recall from 1993 as I write this sentence, specifically California street. I am coming to the coffee shop I would have studied at and ordering a coffee (the waitress now almost 20 years older is pristine as automatons in films, her hair perfect, her voice still clear, her 24 year old self now forever a place marker and yet iconic memory island for some stranger she surely does not recall in a single dust mote or atom ). She has long hair in ironic ponytails and sleeve tattoos, her red and white dress is for some reason what my brain has chosen to seal off in this capsule of past and its architecture. I should also mention that she and I never talked more than order details and there was never any desire for anything more. As I move in memory to sit, the wooden booths are riddled with carved messages of love, of angst or the usual. I have no idea now if these are snapshots of the hundreds across the booths somehow mentally placed again to flesh out this space or if they were at that seat. It does not matter. The floor has sawdust in a corner which was never there which is odd. Oh and most importantly, the front door is as real as one in front of one’s eyes but the back fades into a wood fiber cloud that wipes to nothing. There was a bathroom there, surely some band fliers, some poetic somethings on pages from computers now long thrown to the ash bin of technology in time. It was never the core of any key moments, it was not deemed worthy in this essentially simulated environment , it has died and gone as has a whole wall. I will walk on soon. The street as I leave the coffee shop (as remembered incompletely) is half theme park shine and bright colors and half ruin, not even ruin just as thought it was never brick, mortar or form at all. Time and the janitor of data inside have only left a few clear places of either highest repetition/usage and related minutia or sensory elements tied still to architecture and place: the tiny place that served the best cheap, cheap pork buns beside a store selling overpriced vcr repairs and air fresheners. The smell and taste are almost tangible as I walk by in recall and turn to look north and see jagged broken teeth shapes of various apartments and stores, a dystopic dr Seuss like vision of places that have now this tragic near vestigial sense of form and relation to those yummy pork buns that have not touched my lips in 17 years, a smiling older woman and man handing them to me in a bag who are actually an amalgamation of 5 different owners of this place that has long been gone in the real San Francisco. 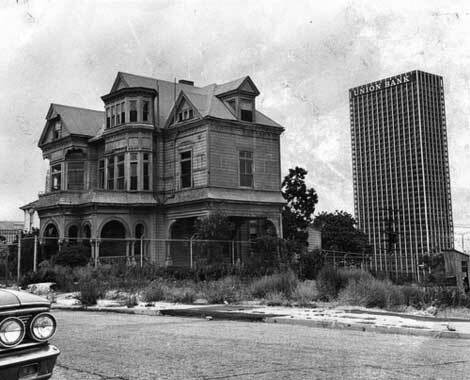 Ironically, there likely are some of those wiped clean places still around now in the San Francisco so different from the one of this fluid past and memory. This carnival of memory in its color palette and little decapitated filmic scenes from some lost place alights along the street for a few more blocks then die into a jumble of tree shapes and some big rectangle ( a church? A temple? Some spatial junk at the stump of a broken memory and its place?). Some classic questions long covered in different fields now come to mind. If you cut a whole in a wall of an office building and its guts (offices, workers, machines, spaces once interior till this point) does this break the spell of functional architecture, of the safe to dull room versus the din (be it of nature or people, of peaceful interactions or wicked storm and angst and dystopic rush)? Have the two converged and some kind of ballast released? Or is it just a tiny rupture like so many things forgotten or stamped with a level of irrelevancy amongst it all? What is the relationship between our increasingly map/digi space related sense of place and how we remember places we have been? Grandma’s house. South Central Los Angeles. Around 1980. The old house now in recall still has a hard slamming screen door and big porch. Her mailbox is full of mail, blooming with bills of some day and visit, the paper bending in some breeze in this false world. She smiles in polyester pantsuit and oversized collar, this memory far preferred to the reality of her long gone, the way she died so suddenly in that 1920’s tiled bathroom by piles of magazines and newspapers her depression survivor heart and mind simply see tossed away. I am walking past my grandfather chain smoking his More cigarettes in his forever sandy crew cut and grimace, his other hand holding the remote to a giant tv that outlived him by ten years, his former alcoholic post stroke soda stash by his feet. The smells come fierce in recall now: old cigarette smell, diet root beer, mustiness. The gang leader across the street has not yet helped her mail , his o.g status years later to stop the kids from stealing her checks, that is another place, its architecture comes later. I am a boy, this is a sleepover, meatballs are cooking in the kitchen forever here, the sweet smell of raisins, part of her special recipe, it wafts even now, colliding like a gentle storm front in the quiet stink of my grandfather’s chair and corner of the front room. I walk past piles of recipes next to a 78 record player that my mother and her sisters’ recorded records on, a new technology of a past before my days I otherwise would never have dreamed of. The kitchen is pristine, she is smiling by her ancient fridge and the sun comes in through a window from the overgrown backyard. This is the place of a weekend away, of this wonderful woman long pushed gently into the earth, her bed for years holding the exact shape of that angry man after he first had been tucked in the soil , this space not in this memory, not now. It is of sun and the love of a Grandmother. The yard out of the window fades into bright white with only a fence in the light and blank spaces that seem to on forever. I want to linger here. What is the map in relation to the measure of place in recall? What narrative archaeology can be made of memories of place as much as of the data, history and narratives made of a place? Must one always measure a building by its walls and bricks, rooms and address alone? GPS is a skin of coordinates and now layers, but what of the human element? What of the forms of place seen by those who have been there, lived there , the range and scale of what is remembered (individually and collectively in great range)? What of what is lost over time can we layer on maps as much as what is there? A fierce santa ana wind is blowing so hard it is bowing in the window here in 1987 in my bedroom. The dry wind other years will send huge fires up and raging, some to burn to the ocean shore so far from here. My mother’s Multiple Sclerosis has sent her through the sad progression from walking to cane, to 3 prong cane, to walker, to wheelchair…soon it will be the humming electrical one she will ride around in until her body denies her even this. But in this memory and place she is asleep downstairs while the wind blows and will awaken to another day here in this world , this tissue paper thin world of many slivers of past and place. The stereo plays a Kraftwerk record, that one scratch soon to click and pop. The wall posters are Theda Bara and SST records. The bed by the wind has covers that change colors , I guess I can’t remember which ones to fit here so it flickers like some insane illuminated sign or a John woo film fight scene set to fabric. It is a melancholy room. The walls are a bit dirty and the closet is cluttered. The bright green of the artwork Cameron Jamie gave me when we were friends glows in recall amongst crushed books, magazines and old clothes still vivid now. The wind again bends the window, this time in the shape of a glass toenail. My brother’s room down the hall as I walk toward it moves from painted lines in the wall, Rush records and a surfboard to the empty room and mattress on a floor, the dusty hall of spiders it became a decade later. The bathroom as I pass has bent wood for the floor, the shower is a glass so frosted in recall that it is near white. The sinks are aligned and waiting with a sad little floor dresser full of aging junk and beer cans. The window is a hole and the wind should blow through now as I move toward it but this synthetic place has no wind, only this illusion outside, outside the illusion inside that I still dream of, have nightmares of, hold onto for reasons I can never grasp. I walk down the stairs and front door is vivid and feels accurate while the hallway is half empty and half some stock image from a hundred horror films, the huge impossible banister pointing out to the windy night that forever exists and is long crushed into a past never to again be touched. This place I want to leave but in dreams I will always return. A building or a room never looks the same after arriving and especially after leaving. There is something to this. Something to be explored. I am now getting a glass of water. In my memory of 1976. The hall carpet is puke orange shag which is probably something from films that was deemed to fit. The walls are crooked and seem extremely high, this must be from being a boy of 6, the scale is off like the child’s drawings of purple sky, planes with wings at odd angles with the logic of faces in a fake Picasso portrait painting, of cars flat as crushed cardboard and cats and dogs seemingly made of wires and cute awkward smiling faces. This makes sense in an odd way. The bathroom as I pass is vivid and feels accurate. The kitchen as I turn a light on in this memory comes alive with earth tones and a sense of having left in the real world just minutes ago until I now reach for a glass and essentially violate the belly of a cloud. The cupboards have eroded away in these decades, the sad bastards not relevant enough, maybe not individuated, like those people in the background in iconic photos and crowds. A romantic notion is to imagine these people as somehow incidentally remembered, some passive sort of recall becoming extras in dreams at night. Who knows, probably not. The glass has little gold flowers on it as the water from some place holder from 35 years fills the glass. Jeremy Hight is a locative media/new media artist and a writer. He is credited with inventing locative spatial narrative in the first locative narrative project 34 north 118 west. 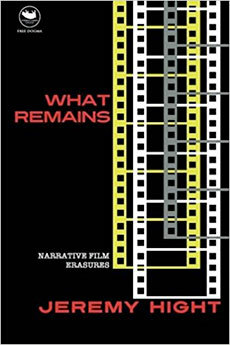 His essay Narrative Archaeology was recently named one of the 4 primary texts in locative media. A retrospective look at his work and a look at "reading" the landscape is in volume 14 issue 08 of Leonardo. He has published over 20 theoretical essays and exhibited work in festivals and museums internationally.